What mobile / Which Mobile? If QMobile E900 specs are not as per your requirements? Find your desired mobile by selecting right features, price, specs using our advance mobile search facility. Feedback In case of any mistake in QMobile E900 prices, photos, specs, please help us using our contact us page. Disclaimer: QMobile E900 price in Pakistan is updated daily from price list provided by local shops but we cannot guarantee that the above information / price of QMobile E900 is 100% accurate (Human error is possible). For accurate rate of QMobile E900 in Pakistan visit your local shop. kYA IS MY SKYPE CHALTI HA?? ma 2saal sy use kar raha hn.bht acha set ha. hi friendz mobile my mobile software downlnad hosakta hy kia reply me. mobile is in good condition,internet software is downlaoded & protector of screen is attached & back covers & charger is available. i want to sell it in 3000. - QMobile E900 best price in Pakistan is Rs. 0 Pakistani Rupees (PKR). - One can buy QMobile E900 pin pack from the best online stores or local shops, whichever offering cheapest price. - Always confirm mobile specs, features, warranty, shipping cost and delivery time from the seller before you pay for QMobile E900. - Some online stores sell used and refurbished models as well, so check E900 details from the seller before ordering. Qmobile E900 is a Touch-sensitive mobile phone which markets with a variety of package in reasonable price. Qmobile E900, with Dual Sim Card-Dual standby has 2.8 inch screen & gives 240x320 resolution. Qmobile E900 has 3.0 MP Camera can take not only pictures but also record video as well. 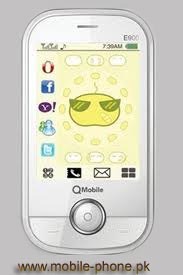 Qmobile E900 comes with all social networking which is helpful for updating and chatting with your friends.